The Vancouver Condo Buzz » Exclusive Waterfront North Vancouver TROPHY at the Pier Lower Lonsdale Condos for Sale by Pinnacle along Victory Ship Way > Amazing Opportunity! Exclusive Waterfront North Vancouver TROPHY at the Pier Lower Lonsdale Condos for Sale by Pinnacle along Victory Ship Way > Amazing Opportunity! North Vancouver’s premier waterfront residences are coming soon to TROPHY at The Pier in Lower Lonsdale. Imagine the calmness of the water; you can almost touch the stunning Vancouver city skyline, the sun setting behind Stanley Park, Lion’s Gate Bridge slowly lighting up and the North Shore mountains as a distant backdrop. At the Lower Lonsdale North Vancouver TROPHY at the Pier condo building, you are surrounded by all of this as you relax or entertain family and friends. There are few waterfront residences that offer a front row seat to the beauty of Burrard Inlet and Downtown Vancouver. You deserve only the best. Claim your reward. Live at Trophy at The Pier condos in Lower Lonsdale. The sales centre for the TROPHY North Vancouver condo building is now open at The Pier at 172 Victory Ship Way North Vancouver. 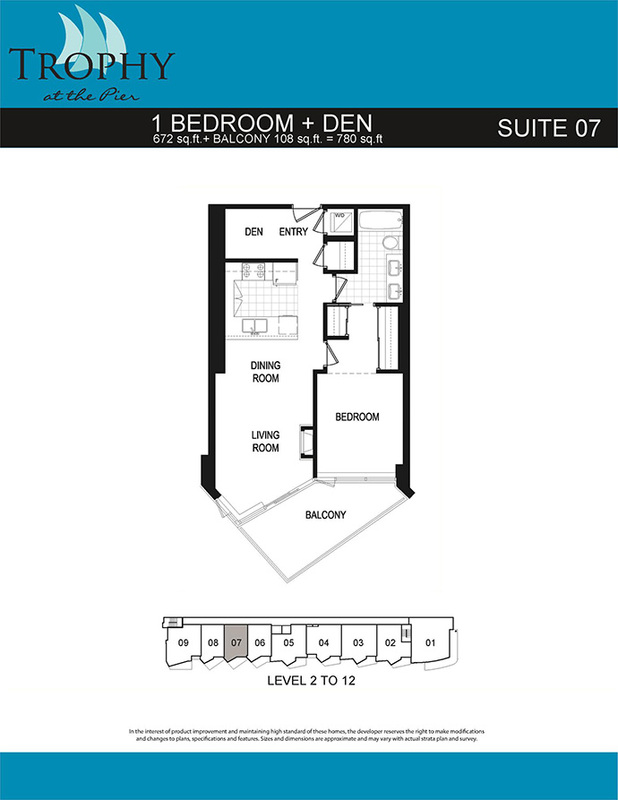 The TROPHY Lower Lonsdale condos are situated in a master planned community called The Pier by Pinnacle International. Visit www.thepier.ca for the latest details about this project. The Trophy North Vancouver condos for sale start from $509,900 according to the latest online sources and they are located right along the waterfront boardwalk at 172 Victory Shop Way North Vancouver. The North Van waterfront real estate development by Pinnacle International will feature only 113 exclusive waterview and waterfront Lower Lonsdale apartment homes with balconies that jut outwards, giving most homes prime uninterrupted views of the water and downtown Vancouver city skyline. The scheduled completion date for The Trophy at the Pier North Vancouver waterfront condos is for mid 2015 with construction starting mid 2013. Pinnacle Trophy North Vancouver waterfront condos will be a high-rise of 13 storeys. The presales North Van Trophy floor plans range from 1 bedroom plus den layouts and between 672 to 1,466 square feet making them some of the largest floorplans in The Pier Lower Lonsdale master planned neighbourhood. The realty agency is Anson Realty and at least one parking spot is included with the purchase price (along with one bike storage). The Lower Lonsdale Pier Trophy condos will feature hotel amenities such as housekeeping services, a private rooftop hot tub, BBQ areas and a rooftop terrace deck with amazing views. In addition, there is room service (at extra charge) a swimming pool plus facility and fitness centre as part of the hotel that you have access to. Imagine the calmness of the water; you can almost touch the stunning Vancouver city skyline, the sun setting behind Stanley Park, Lion’s Gate Bridge slowly lighting up, and the North Shore mountains as a distant backdrop. At Trophy North Vancouver waterfront condos you are surrounded by all of this as you relax or entertain family and friends. There are few North Shore real estate waterfront addresses that offer a front row seat to the beauty of Burrard Inlet and Downtown Vancouver. At the North Vancouver Trophy condos, your home will make the statement: YES, You have arrived. Starting from $509,900, the exclusive residences at The Pier’s Trophy condos will feature amazing interior specs (subject to change at any time). They include air conditioning for year round comfort in addition to baseboards and crown mouldings. Other interior details at the Lower Lonsdale Pier Trophy condos include designer carpeting with hardwood or porcelain tile option and custom designed electric fireplaces in the living space that have granite mantles (custom made). 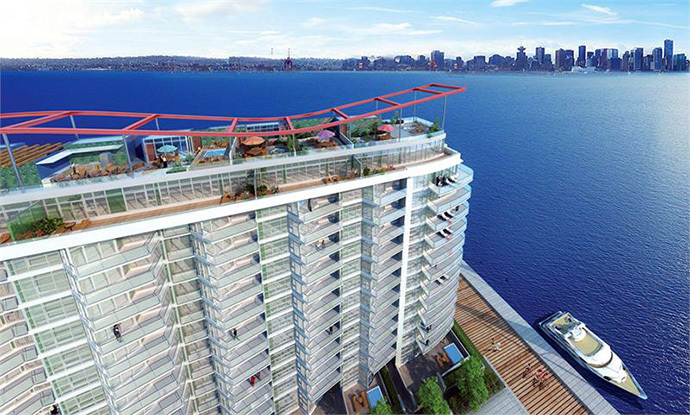 The Pier’s Trophy North Vancouver condos will also come with custom stained wood suite entry door with privacy viewer. In addition, all of the new Trophy North Van presales condos will have floor to ceiling over height windows that bring in lots of natural light as well as premium outdoor living spaces in the form of terrace decks and/or balconies that give you uninterrupted views of the downtown Vancouver skyline and the water before you. 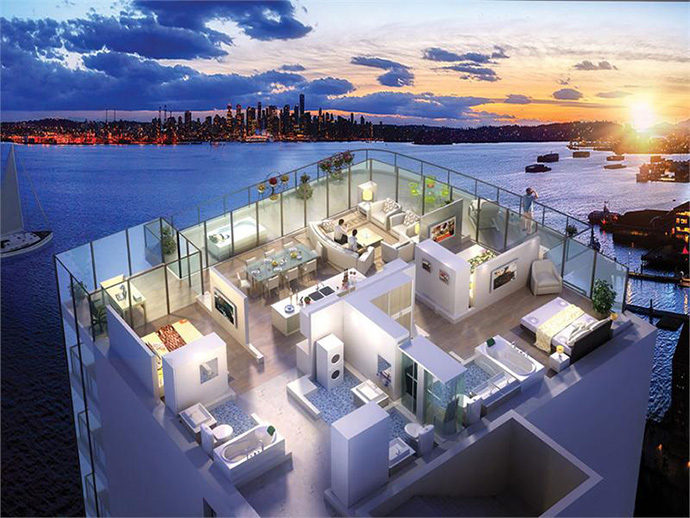 There is also an exclusive Trophy North Vancouver condo building roof top deck that you have access to at any time. There are 113 waterfront condos available for purchase starting from the low $500k range in a 13 storey high rise building. 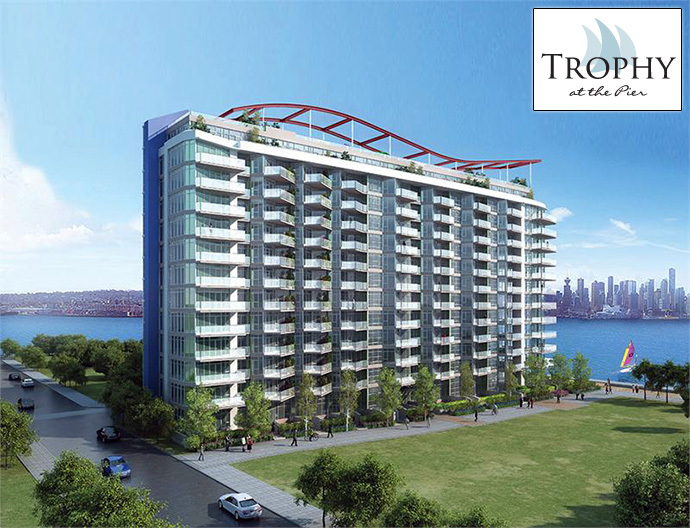 Located in the prime Lower Lonsdale Pier neighbourhood, the Trophy North Vancouver waterfront condos for sale will be set for construction in 2013 with eventual completion in 2015. The developer is Pinnacle International.